Windows 7, 8 and 10 user accounts that have administrative privileges operate differently than admin accounts in previous versions Windows. Rather than giving administrative accounts complete and unbridled access to everything on the PC, these accounts operate as normal user accounts until an action requiring admin privileges pops up. At this point, the account enters Admin Approval Mode so the user can approve the action. Much improved over Windows Vista’s handling of admin approval, Windows 7/8/10 strikes a balance between security and usability. Fortunately, Microsoft makes it possible to further customize how Admin Approval Mode operates on a PC. Depending on where your computer is located and who uses it, you can upgrade or downgrade your PC security by changing how Windows 7/8/10 uses Admin Approval Mode. You can also read my post on how to turn off Admin Approval Mode. Note: In order to access Local Security Policy on a Windows computer, you have to be running a Pro version or higher. This will not work for Windows Home, Home Premium or Starter editions. To make changes to how Admin Approval Mode works on a Windows 7/8/10 PC, begin by logging into the operating system using an account that has administrative privileges. 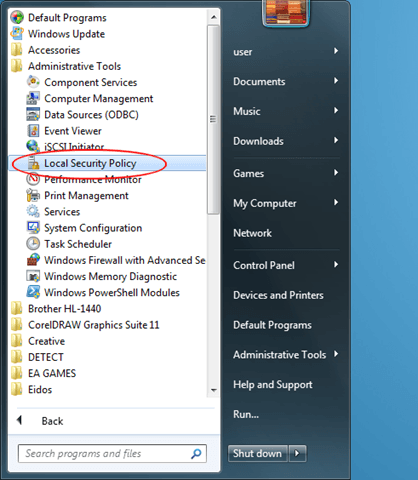 Click on Start – All Programs – (Windows) Administrative Tools – Local Security Policy. You should now be looking at the Local Security Policy options window. 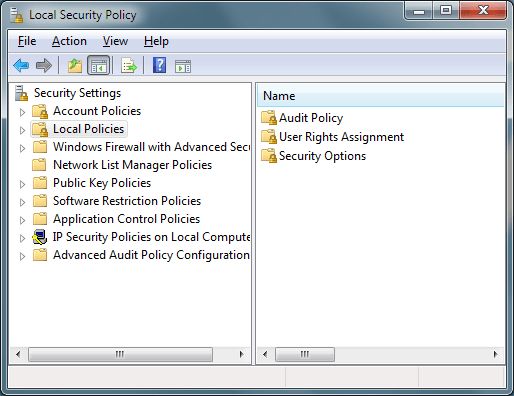 In the left hand pane, click on the folder titled Local Policies and then on the folder labeled Security Options. 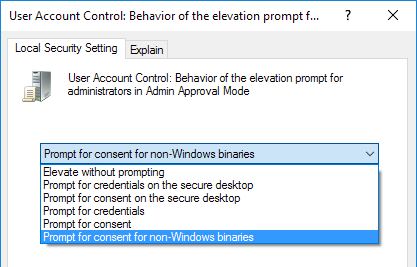 Locate an option in the right hand pane titled User Account Control: Behavior of the Elevation Prompt for Administrators in Admin Approval Mode. Right click on this option and choose Properties from the menu. You will notice that you have six options in the drop down menu in the properties window. Below is a description of each option for Admin Approval Mode elevation. Each of the six Admin Approval Mode Options forces Windows to operate differently when it comes to elevating approval for applications and functions that require approval to run in the operating system. Note that secure desktop is when the entire screen dims until you accept or deny the request in the UAC prompt. Check out my other post to understand how UAC works. This is the most convenient option, but also least secure option. Whenever an application or function tries to run that would normally require approval from an administrator, the application or function will run automatically as if it were already given permissions to run. Unless your PC is in a super secure location isolated from networks, this is not a wise choice. This option is more secure than the default setting. Whenever an action pops up requiring approval from an admin, Windows will actually prompt the user for a username and password on the secure desktop. Rather than prompting for a username and password like the option above, Windows will simply ask the user to approve the action on the secure desktop. This option operates similarly to the option above titled Prompt for Credentials on the Secure Desktop, except that the user types in the username and password without the added security of the secure desktop. Like the option above titled Prompt for Consent on the Secure Desktop, this option simply asks the user to approve the action but does so without the added security of the secure desktop. This is the default Admin Approval Mode option. With this option, users are required to consent to an action only if it requires approval and is not a verified Windows action or executable. Binaries are simply compiled executable code synonymous to applications or programs. Second only to the Elevate without Prompting option above, this is one of the most liberal Admin Approval Mode options. Windows strikes a good balance between security and an uninterrupted computing experience, but still allows you to further customize how you consent to actions that require admin approval. By altering the Admin Approval Mode options, you can create a customized operating system environment allowing you to increase or decrease security depending on your personal need for administrative security.